There are lots of way you can make your wedding eco-friendly. You need to think recycled and reuse. Once you have that particular mindset, the ideas will come flooding in! Below are just 5 eco-friendly wedding tips but there are loads of other things you can do if you put your mind to it – for example, use vintage crockery for the wedding breakfast and buffet instead of paper plates. You can reuse these items over and over again, or hire in some crockery. Or, another example, arrive at your venue by pushbike or electric car, instead of an expensive gas-guzzling limosine. For your wedding rings, consider having some old rings you never wear melted down and remade into your wedding ring, or how about a wedding ring made from wood – possibly wood you collect in a nearby forest or woodland. When you start to think of every aspect of your wedding, you will be surprised of the alternative ideas you will begin to think of to not only make the wedding cheaper than having brand new stuff but to also make it eco-friendly. 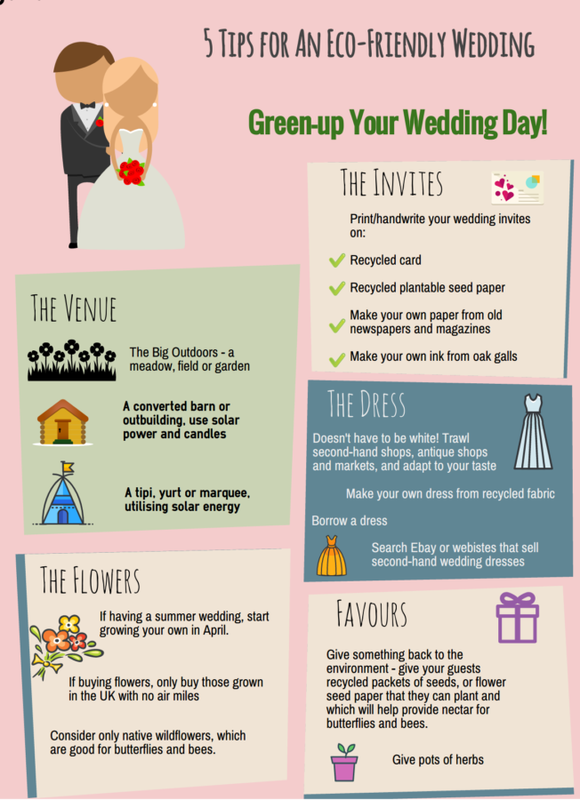 Let us know of any other eco-friendly wedding tips you have or that you used at your wedding! A Lovely day with the Wedding Sheep!